STILL PLANNING where to go for new year celebration? We at Tikona Picnic and Camping welcome you all for a memorable evening. 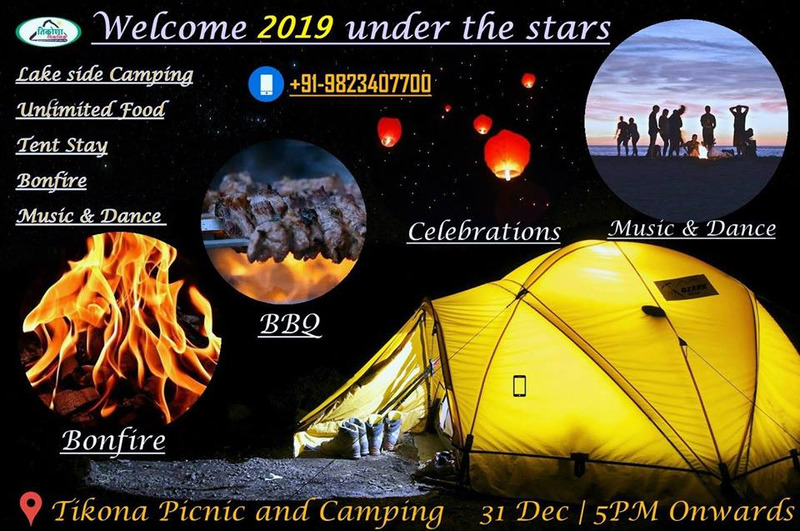 Let's come together and welcome 2019 under a blanket of stars, around a cozy campfire with some lip-smacking BBQ and unlimited veg/Non-veg dinner with family, friends and your loved ones! Tikona picnic campground is surrounded three sides by Hadshi lake and one side by the great Tikona fort which guarantees a Mesmerizing evening and an unforgettable experience. => Arrival at Campsite around 5PM. => Enjoy the bliss of the landscape around the Hadshi Lake and with the windy breeze rejuvenate your soul with Tea/Coffee. => Enjoy the sunset and relax on the cot near the lake. => As the sunsets proceeds and the dark blanket spread over the lake and at campground enjoy the Bonfire with the typical mystic setting. => Barbeque serving while you are relaxing. => when finally the moods set, get ready for authentic homemade Veg/Non-veg Dinner. => Set the perfect day start with the Breakfast. => Do not carry valuables or items like jewelry, laptops or any other things. => Management & Campsite is not responsible for any kind of loss or damage to your belongings. => Do not smoke in public areas or light any items inside the tent as it may cause fire in the tent. => Please Remove your footwear outside the tent and keep tent neat & tidy. => Weapons or any inflammable things are not allowed on the premises or in the tent. => If any damages are caused to the campsite, tent or bedding, camper/ guest will be responsible for the damage and will have to pay the charges for the same. => STRICTLY NO USE OF DRUGS IN ANY KIND OR ANY FORM OR ANY OTHER KIND OF INTOXICANTS. =>All guest must follow the camping rules and co-operate with us so that we can make this event sucessfull, like last may years! Looking forward to hosting you all!!! - Yes, washroom and shower room is available. 2. What is the age group criterion? - Any age group can enjoy at Lakeside, as campsite is fully safe. We have college group, reunion camping, company team outing, family picnic and etc. 3. How will be the stay facility? - Stay will be in Dome shaped Tent (sharing of 3-4 basis) along with Matt, Sleeping bag/blanket.